In this video, we are going to look at how to simplify numbers raised to negative exponents. we have to move the 4 to the denominator and make the exponent positive. we have to move the x to the denominator and make the exponent positive. 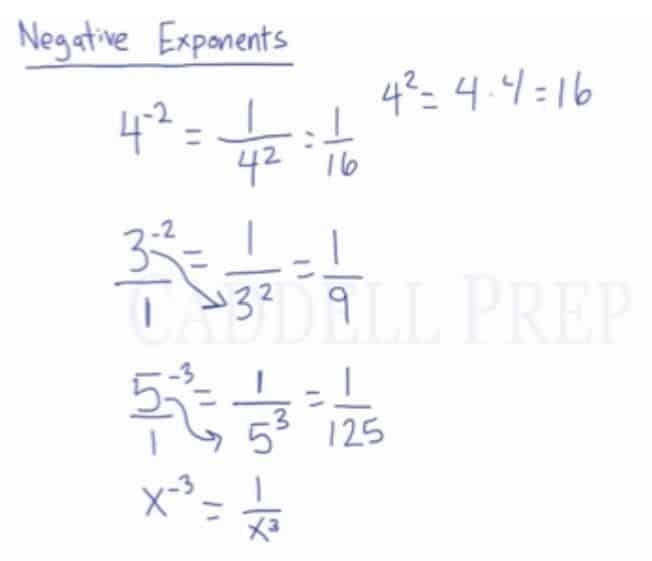 Let’s have a quick look at negative exponents. But here we have a negative exponent. This has a different meaning. We’re still going to do but the negative is going to change where we do that. So whenever we have a number raised to a negative exponent, we’re going to move it to the denominator and make the exponent positive. Notice that our answer is not negative. The negative in the exponent has nothing to do with our final answer. It just shows where we’re going to do . We’re going to move it to the denominator. So, we’ll just move it to the denominator. If you’re wondering where our numerator came from, it’s a regular thing. Since is the same as . So we’ll do the same thing. we’ll move it to the denominator and change the exponent to be positive. And the same is true for variables. The reason why I’m teaching it as numerator-denominator style is that it may become more complex. the thing here is that the is the only one raised to a negative exponent. Not . So when we solve this, stays on the numerator and the will be on the denominator and change the exponent to positive. The only variable to change to be a denominator is , the rest stays where they are. In all the other cases, we have a negative exponent but all are in the numerator. In this case, we have a negative exponent on the denominator. So what we’ll do is to do the opposite. We’re going to place the negative exponent to the numerator then change the exponent to positive. So wherever the term with a negative exponent is written, put it to the opposite location. If it’s on the numerator, put it to the denominator and make the exponent positive. If it’s on the denominator, put it to the numerator and make the exponent positive. Keep in mind that the negative exponent does not affect the sign of the answer.